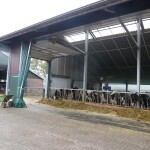 During a short visit to the Netherlands one a of the many things I picked while on this study tour ( many thanks to Effective Micro organisms for sorting this), was the fact that most of the dairy cow buildings we walked around where mainly insulated , to help control the climate in the shed. Insulation as we know does help maintain a more consistent temperature and avoid the peaks and troughs that can be apparent in un insulated sheds, resulting in condensation and interrupted air flow. In the UK to find a insulated dairy cow building is in my experience quite rare (I stand to be corrected), we do have a lot of open big spanning buildings which can have air temperatures which vary greatly over the duration of a day, we really do get excited about air flow , which is I am sure is right , but do we need to look at insulation maybe as a option I know there is a cost implication but there could be long term benefits to consider, after all the dairy farmers in the Netherlands won’t just insulate for the fun of it.